COSTA MESA, Calif. /California Newswire/ — LendingQB, a provider of end-to-end loan origination software, today announced that Venta Financial Group, Inc., a wholesale and retail mortgage banker, has experienced stellar results since implementing its browser-based end-to-end loan origination system. Venta operates two distinct brands under the names of Venta Wholesale and Alterra Home Loans for its wholesale and retail lending channels, respectively. Using the platform, Venta was able to automate every single facet of its lending business, thus achieving a seamless workflow from the point-of-sale through funding, transparency across operations, automatic compliance audits, a completely paperless environment, reduction of cost per loan and greatly enhanced employee communications. "Venta has done an outstanding job of leveraging our LOS to operate leaner and with greater productivity across the board," said Binh Dang, president of LendingQB. "They worked with quite a few best-of-breed providers in the past and saw integration deficiencies and workflow issues first hand. The team at Venta now takes a holistic approach to driving lending improvements and we're pleased that our LOS has been instrumental in their success." 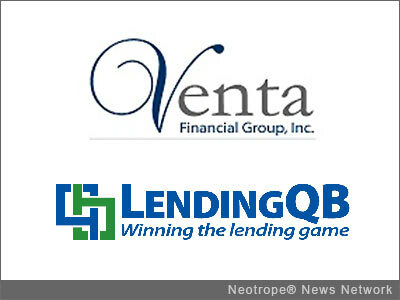 Prior to LendingQB, Venta tried to use best-of-breed vendors to create an end-to-end solution but the approach failed to meet expectations, instead hampering intercompany communications, preventing visibility, disuniting key functional areas involved in the lending process, and slowing turn times. "We tried using best-of-breed providers several different times but were never able to really implement the seamless workflow we envisioned having," stated Jason Madiedo, CEO of Venta. "LendingQB's platform, on the other hand, is an all-in-one solution that was custom-configured to automate our specific lending practices, which created a completely unified, smooth workflow. Our employees love the system and how much easier it makes their jobs and ability to communicate with other functional as they work to complete tasks. LendingQB basically perfected nearly every facet of our lending operations." Venta also reports that LendingQB's LOS helped significantly with recruiting efforts due to the solution providing tools that help make them more productive and successful. "We've really gotten a lot of lift on the recruiting front when prospective loan officers, originators, underwriters and others learn how much easier things are using LendingQB," remarked Madiedo. "In addition, the platform's flexibility and ease of set up has allowed us to quickly get new branches and offices up and running." LendingQB is a Costa Mesa, Calif.-based company that specializes in loan origination technology solutions and services for the mortgage industry. The LendingQB LOS is a 100 percent Web-based, true end-to-end enterprise-class loan origination platform. The solution is designed to meet the needs of all types of mortgage lenders-large or small, wholesale or retail, correspondent or Internet-based-with specialized tools that are targeted, customizable and flexible. LendingQB uses a consultative technology assessment approach before engaging with new clients, and places a strong emphasis on the utilization of data analytics to assist lenders in leveraging business intelligence, resulting in optimized organizational performance and lowered cost per loan. For more information about LendingQB, please call 888-285-3912 or visit http://www.lendingqb.com/ . Based in Las Vegas, Nevada, Venta Financial Group, Inc. owns Venta Wholesale and Altera Home Loans, its wholesale and retail channels, respectively. Venta Wholesale opened its doors in August of 2007 and currently has over 150 employees. Venta has loan officers, account executives, multiple DE underwriters, closers, lock desk resources, and more than enough support staff to help close loans on time – every time. Visit the company's website to learn more http://www.goventa.com/ .